LOS BAÑOS, Laguna—With the ongoing coconut scale insect (CSI), commonly known as cocolisap, infestation affecting areas of Zamboanga region, key experts met to polish targets and strategies of the two newly approved projects that will implement rapid and efficient response to address the invasive coconut pest. The experts are from the Philippine Council for Agriculture, Aquatic and Natural Resources Research and Development of the Department of Science and Technology (DOST-PCAARRD), Philippine Coconut Authority (PCA), De La Salle University (DLSU) and University of the Philippines Los Baños (UPLB). The epidemic caused by cocolisap has been reported in the whole Zamboanga Peninsula, after its infestation in Basilan reached the borders of Zamboanga City. This posed a serious problem as some of the largest coconut plantations and several important accessions of coconut are found in the region. Most important, it is a threat to the largest coconut germplasm collection in the world, which is located at PCA-Zamboanga Research Center (PCA-ZRC). Ramon L. Rivera, division manager of PCA-ZRC, and Dr. Divina M. Amalin, entomology and nematology expert of DLSU, will lead the projects. The project will identify suitable control measure, expand rearing facilities and assess efficiency of cocolisap pest response in the region. Rivera will focus on developing an Science and Technology protocol on the utilization of the parasitoid, Comperiella calauanica, and on the enhancement of natural controlling factors for the sustainable management of CSI at PCA-ZRC and Zamboanga City. Amalin, on the other hand, will lead the implementation of integrated pest-management strategies through infestation mapping and proper pest control application to address the infestation in Zamboanga Sibugay, Zamboanga del Norte and Zamboanga del Sur. To provide technical guidance for the smooth implementation of the projects, Dr. Celia Medina of the Institute of Weed Science, Entomology and Plant Pathology of the College of Agriculture and Food Science of UPLB also attended the meeting. She encouraged close collaboration between the two implementing agencies in order to properly execute their work plans and effectively control the infestation. She added that a proper production system should be developed and quality standards should be identified based on what is more applicable on the CSI status in the region. According to the director of the Crops Research Division (CRD) of DOST-PCAARRD, Dr. Jocelyn E. Eusebio, these projects are already extensions of initial efforts made to control the infestation of CSI in the country. However, she still hopes that the meeting serves as a venue to identify and implement new strategies to rapidly address the problem of cocolisap in Zamboanga. 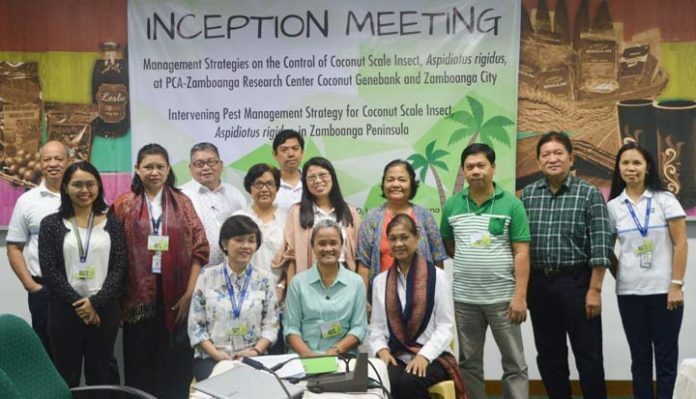 With this action research, a system that will aid in pest-response detection will be established to address the infestation not only in the Zamboanga Peninsula, but also in other coconut-growing areas in the country. The meeting was organized by CRD of DOST-PCAARRD and Industry Strategic S&T Program Manager for Coconut Dr. Edna A. Anit. It was also attended by several DOST-PCAARRD, PCA and National Crop Protection Center-UPLB staff members.